No AAR, but I did grab some pictures at Cold Wars – mostly of my Saturday game. Enjoy. So finally I finished up the impetus for this project – the Brigade Games U Boat. Being a gaming piece first and foremost I wanted it to be easy to store and transport, so decided to not go overboard (see what I did there) with the detail. I made the decision early on to leave it as a three piece affair and to magnetize as many pieces as possible. The kit came with a single 20mm, the 8.8cm deck gun, two periscopes, an UZO pedestal and the posts for the railing at the aft of the conning tower. Surprisingly missing were the iconic (to me) horseshoe shaped life rings. I was able to find some 1/48th scale ones on Shapeways along with a more detailed UZO and a circular range finder. Assembly of the guns was pretty straight forward, and I magnetized the bases of these along with the periscopes and the UZO. I then used some solder to create the aft railing. I affixed the life rings but decided to leave off the RF antenna. It was housed in a box and I didn’t want to sacrifice any more real estate in the conning tower as I wanted to cram some based figures in there. After that it was a matter of firing up the airbrush and giving it a coat of paint. The markings are hand painted and are my interpretation of the U-201 coat of arms and snowmen. Additionally I scabbed together a couple of gangplanks from basswood strips. The rubber dinghy is from Bandai and the supplies are from the scrap box. Finally I’ll put the finishing touches on the figures for the orders of battle and gin up a few play aids. When I started laying out this board in my head I knew I was going to want to fill up some space by the mooring location with something other than a building. I thought some sort of crane would be visually interesting and tie in with a few other bits I was planning on having in the vicinity. I wanted something that was good and tall – a good place for an MG team or a sniper. Also I wasn’t too concerned with historical accuracy, looking for something that would fit in an Alistair MacLean story. Not having much faith in my scratchbuilding skills I was delighted to find this Things from the Basement kit at Fall In. It’s a bit modern but I figured I could change it a bit. 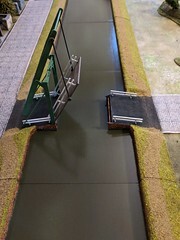 I built the base and the rails straight form the kit, only adding some sand texture to the platform. I ended up taking quite a few liberties with the cab using some various kit and spare parts. Here’s what I came up with. I’m not sure if the physics would work for the winch, but visually I like it. Here it is almost complete. I have some cable and a hook to add, but am waiting to complete other things before I commit to the length. Next up I’ll be working on a few vehicles, some u-boat mines and a torpedo cart. My new compressor showed up so I was able to complete the storage shed. It’s a Things From the Basement kit, and I built it straight out of the bag. The miscellaneous supplies are from various sources. The pallets and cable reels are from Things From the Basement, the fuel drums are from Tamiya, the stack of sacks and the grey boxes came out of my 1/35 scrap box, the bundle of crates and barrels are from Grand Manner, the other crates are 4Ground and the single barrels are pre-paints from an unknown source. Next up, the harbor crane. I had a few moments this weekend to devote to finishing up the “non-dock” part of the board. 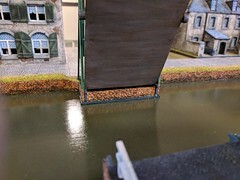 Wanting something to delineate the commercial/residential area from the mooring area, I painted up a few sections of walls from Charlie Foxtrot. I also added in a checkpoint from 4Ground and some sandbag sections that I believe are from Warlord. Also I added in a few more detail pieces. The doghouse is from Warbases and the small stack of newspapers is some parchment paper glued together, painted and then soaked in the bottom of my afternoon tea for a few minutes. Thanks to my friend Richard of Warpstone Pile for sharing his technique for the newspapers. While I’m waiting on a new air compressor to show up, I’ll be working on some detail pieces for the mooring area. Mid-week I’ve been working on rounding out some of the bits and bobs for the town and adding in the remaining buildings. I’ve used this WWI memorial statue “as is” for a few years now, but always felt that it needed dressed up a bit, so I put together a small memorial garden to surround it. I cut a base out of plastic card, and then added some HO scale hairpin fence around the perimeter. I then painted and flocked the base, and added some bushes and flowers. I’m not completely satisfied with it – I feel there’s too much red going on – so I may circle back and add some different flora. Thomarillion has this nifty cast iron water pump that I picked up a while ago, and I thought it would make a nice bit for the town. I scratch built a concrete catch basin by making a box with balsa and covering it with Liquitex Stucco Texture. Then it was just a matter of some paint and washes. Here’s the remaining buildings for the town, again from Grand Manner. The warehouse truck is from Blue Moon and the clothes line was made from balsa and an old foil wine label. Next I’ll start working on some walls to delineate the town from the dock area. I’ve decided to work my way from the town toward the U-boat so I can knock out some “low hanging fruit” to motivate myself. While I had the draft layout setup, I measured and trimmed an old fleece blanket gaming mat I had to use for some grassy areas. This was my first attempt at having a blanket printed and it ended up with some flaws, so I didn’t feel bad about chopping it up. Here’s the first section with the church, Dr’s house, cafe and small house on it. These buildings are from Grand Manner as are the sidewalk sections. When I run convention games I usually bring a shaker of flock with me that I’ll use to dress up the transition areas, like the one below. I guess I’m willing to trash a convention hall floor, but not my basement. I like to add some detail pieces to my boards to dress them out, so here’s some shots of my proposed minutia. I had some empty space by the Dr’s house that I wanted to add a greenhouse to. I already had the piece from Warbases and decided to detail it a bit. I covered some of the seams on the structure with cardstock, and then fashioned some potting benches out of Renedra bases and plastic rod. The flower pots are from Scenic Express, the tools are from true2scale and the other bits came from the spare parts bin. Some paint slapped on and voila. I decided to add a plant that I hacked together with a pot from the craft store and a small scale Woodland Scenics tree. The brick on the floor is cardstock. I downloaded the texture from Paperbrick. I added in some “glass” by cutting an old sheet of inkjet transparency. Here’s the final product with the base flocked. I added a few garden tools on the outside, also from true2scale. Next I’ll be ginning up a small memorial park for the town square.